... is your older cat suffering in silence? Did you know that 30% of cats over 10 yrs of age are suffering from kidney disease? Don't miss the subtle clues that your ageing cat needs veterinary care. The senior cat life stage is from 11-14 years of age and after that point we tend to refer to cats as geriatric. It is the typical period in a cat's life when owners mistakenly put any noticeable changes down to “getting old”. Frequently several things can go wrong at the same time in older cats; however, most of these are treatable and should not be ignored. So frequently owners say they would rather not know if their cat has disease as they seem "ok". Yet often it emerges through the course of my visit that they had noticed plenty of symptoms but put it down to "old age". Old age is definitely not a disease! Sure, with advancing age, comes increased risk of diseases such as arthritis, kidney and thyroid disease and of course, cancer. All of these conditions have one thing in common - they are best identified early and owner education is definitely the key. More than ever veterinary medicine is advancing year by year. Today there is a good chance that symptoms of many old age illnesses can be successfully controlled with treatment. This means lots more cats leading longer and happier lives! Cats deserve the chance to benefit from technology just as we would if we needed medical treatment, rather than being neglected and suffering in silence because they don't cry out in pain as owners expect they would. In my experience many owners are simply unaware of the current treatment options and base their decisions about what is best for their elderly cat on out-dated advice or experience with an elderly cat 5-10 years ago. The aim of my old cat "wellness" initiative is to provide your cat with a customized care program that best fits both of your needs. It is a stage in your cat's life when the aim is to keep them comfy and happy - ideally for a long time. I do not believe in extending length of life at the expense of quality. Together we can work on practical ways to give your cat a dignified later life. Sometimes this may include medications, special diets, adjusting their environment to cope with reduced mobility or just being mindful of the early symptoms of disease. Annual booster - a vital reminder of the immunity started in the earlier years and tailored to your cat's individual risk factors whilst taking into consideration your ageing cats reduced immune system function. Once again it may not be that your cat needs all vaccine components. Arthritis, muscle wastage, heart/lung diseases and reduced vision are particular causes reduced activity/mobility and can lead to reduced water intake, dehydration and constipation which is made even worse by failing kidneys. Accidents outside the litter tray and poor grooming are also common issues that can be related to these conditions. 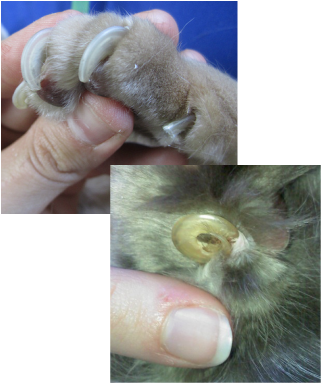 Overgrown claws - claws need extra trimming as they can grow into the foot pads causing significant pain and foot pad abscesses. This can also reduce grip when jumping/climbing exacerbating mobility issues potentially leading to falls and fractures. Long claws can repeatedly catch on carpets/clothing leading to unnecessary trauma of already arthritic joints. Appetite reductions, eating less or changes in food preferences – declining gut function and reduced activity levels can alter calorie requirements. Older cats have a reduced sense of taste & smell and an increased likelihood of dental disease or other illness all of which affect their desire and ability to eat. Deterioration in hearing and vision can mean older cats are more likely to be startled and will take longer to adapt to changes in the household such as moving furniture, new pets. There may come a time when a previously outdoor cat needs to become an indoor cat to avoid accidental injury. Deaf cats can cry during the night or when left alone but this can occur with other diseases so should prompt a checkup. Don't forget that the purpose of wellness checks is not to cause you undue concern but to allow us both to focus on identifying ways to make your cat's life as easy and comfy as possible. Provide soft, warm and comfy bedding in your cat's favourite resting places - a heat pad or hot water bottle can be a well received comfort. Handle with care - muscle weakness and sore joints can mean your cat is more fragile. Pay extra attention to grooming and check nails regularly - I can teach you how to trim nails or we can incorporate a trim into a visit. Provide a variety of scratching surfaces/posts - vertical/horizontal as arthritic cats can change their preference. Feeding - Offer smaller, more frequent meals. Have a variety of foods in stock to pander to changes in preference. Warming the food increases the lovely vapours and stimulates the appetite in an older cat with a failing sense of smell and taste. Lots of attention and TLC!